‘The Talk’ goes to Emerald City for Halloween The Talk takes a walk down the yellow brick road for its Wizard of Oz-themed episode, airing Monday. 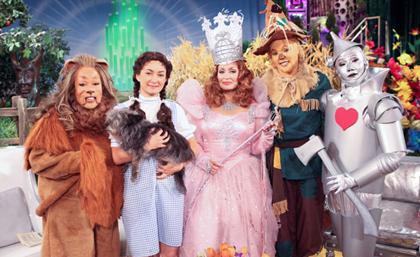 Co-hosts Dorothy (Sara Gilbert), the Tin Man (Julie Chen), the Cowardly Lion (Sheryl Underwood), Scarecrow (Aisha Tyler) and Glinda the Good Witch (Sharon Osbourne) welcome guests Paula Deen and Cloris Leachman. Look for Deen to share her signature Monkey Bread and for Leachman to fly in as the Wicked Witch of the West. The show promises a special surprise guest Wizard of Oz. Vintage Classics Cover Competition: Winner Announcement In March this year Vintage Classics, in conjunction with Young Times in The Times and Random House Children’s Books, launched a nationwide competition for a 7- to 12-year-old to draw the cover artwork for a new edition of THE WIZARD OF OZ by L. Frank Baum. The winner will be officially announced in The Times newspaper on Wednesday 26 October and the book published by Vintage Classics on 3rd November and available in bookshops throughout the country. York College faculty member to have play published John Baker, associate professor of communication and director of theater at York College, says that he screamed and shouted a bit when he got a recent letter in the mail from Big Dog Publishing. It was the letter he’d been waiting for, the one that represented a dream coming true. The letter was to inform him that his play, “The Patchwork Girl of Oz,” was being published. “It was really cool,” he said. “I am now a published playwright, which is something that I’ve always wanted…what it’s given me is validation.” Baker originally wrote the play, which is an adaptation of one of L. Frank Baum’s Oz books, in 1998. Baker says he’s been a fan of the Oz books for many years. “They are imaginative and well-written,” he said, noting that in his own time, Baum was as popular as J.K. Rowling, the author of the “Harry Potter” series. Baker’s play will be available in the July 2012 Big Dog Publishing and Norman Maine catalogs. Wheelock Family Theatre Singers to welcome author with song Wellesley Books is partnering with the Needham Public Library and the Wheelock Family Theatre to present a highly entertaining evening in honor of Gregory Maguire on Nov. 2 at 7 p.m. at the Needham Public Library. The renowned author of “Wicked” will be celebrating the publication of his final book in the Wicked Years series, “Out of Oz.” The evening will begin with a short but stunning medley of songs from the musicals Wicked and the Wizard of Oz, performed by young Broadway performer Katherine Leigh Doherty and other members of the Wheelock Family Theatre. 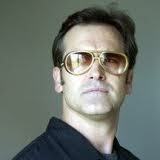 Gregory Maguire will then take the stage to greet fans with a presentation, followed by Q&A and a book-signing session. Doors will open at 6 pm and books will be available for purchase at the library, starting at 6 p.m., courtesy of Wellesley Books. 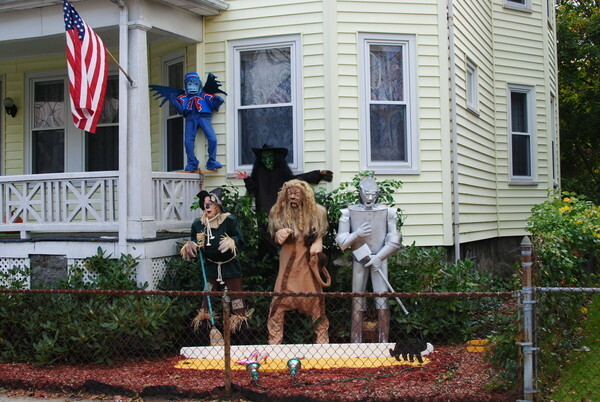 The Wizard of Oz Characters in West Roxbury Are the characters of The Wizard of Oz living in the front yard of a Hastings Street home in West Roxbury? The Wizard of Oz characters seem so life-like by the yellow brick road (and yellow house). The Wizard of Oz on the Big Screen with the Fresno Philharmonic Interact with Wizard of Oz characters and enjoy pre-concert singing, entertainment and art in the lobby one hour before each concert. There will also be fun, kid-friendly and camera ready Wizard of Oz inspired props created by Pioneer Technical Center. Boston Public Library to Host Authors in November and December Gregory Maguire will talk about Out of Oz, the stirring, long-awaited conclusion to the extraordinary bestselling series begun with Wicked. 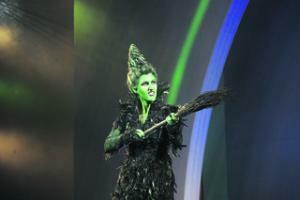 Wicked, now a beloved classic, is the basis for the blockbuster Tony Award-winning Broadway musical of the same name. Rabb Lecture Hall, Central Library in Copley Square, 700 Boylston Street. 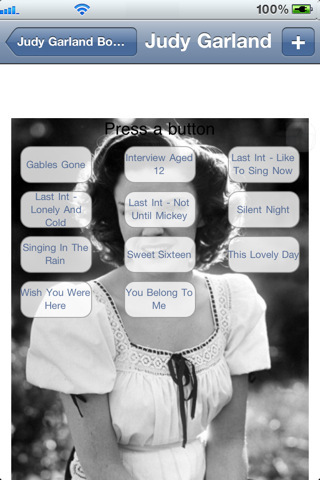 There’s also a selection of photos from days gone by as well as a biography and filmography! World AIDS Day concert to pay tribute to Judy Garland Some of Australia’s leading musical theatre and cabaret performers will be performing the music made famous by the legendary performer. The annual concert, which kicks off World AIDS Day activities across NSW, features top artists like Ricki-Lee Coulter, Paul Capsis, Tim Draxl and Trevor Ashley. The concert will take place on Monday November 21 at Verbruggen Hall at the Sydney Conservatorium of Music with all performers backed by the 40-piece Sydney International Orchestra. Library offers chills and thrills with trip through Oz At the Superior Public Library, a handful of local artists are teaming up to transform meeting rooms into scenes straight from “The Wizard of Oz.” Kathy Hubbard’s art class at the University of Wisconsin-Superior will decorate Emerald City. Head Start students will make the poppy field and a number of children from local day care centers will provide flowers for the set. Some of the librarians have been crocheting apples for the trees to throw, and many have volunteered to dress in costume for the event. Evening of ‘Wicked’ recollections, songs set at Edgerton Center “We will be doing a few of the songs from `Wicked,’ ” said Dee Roscioli, 34, of the selections audiences can expect during two “Women of Wicked” performances on Saturday, Oct. 22. “We will take one or two and do them in an unexpected way. And we’ll be performing other songs that we enjoy singing.” Roscioli, who has played Elphaba, or the Wicked Witch of the West, in several productions of the popular, award-winning musical “Wicked,” will be joined by fellow Broadway performers and friends Katie Rose Clarke and Jennifer DiNoia. In addition to performing, the trio expects to share some behind-the-scenes stories. Cartoon Art Museum celebrates The Wonderful Wizard of Oz At the dawn of the 20th century, L. Frank Baum created a world of wonders that was to hold a permanent place in the culture of America: The Wonderful Wizard of Oz . Then in 1904, to promote his second book, Baum, along with master cartoonist Walt McDougall, brought his famed characters to Earth in a new medium, the comic strip. Famed Oz illustrators W.W. Denslow and John R. Neill also launched their own syndicated comic strips in the early 20th Century. The Cartoon Art Museum’s exhibition will include a selection of tearsheets from these talented artists: McDougall’s Queer Visitors from Marvelous Land of Oz, Denslow’s Father Goose and Billy Bounce, and Neill’s Nip and Tuck, courtesy of historian and publisher Peter Maresca of Sunday Press. Acclaimed writer and artist Eric Shanower’s first Oz comic, The Enchanted Apples of Oz, was published in 1986, beginning his 25-year (and counting!) association with Baum’s characters. This exhibition will feature highlights from five of Shanower’s Oz graphic novels, as well as a selection of art from his latest series of Eisner Award-winning Oz adaptations for Marvel Comics illustrated by Skottie Young. Additional collaborators include Anna-Maria Cool and the legendary Ramona Fradon. Interview / Salman Rushdie is not afraid He wrote his first book, “Over the Rainbow” – inspired by “The Wizard of Oz” – when he was ten. It was a portent of his flirtation with cinema – in recent years he has taken part in more than 40 films and television programs, mostly playing himself. In an essay Rushdie wrote about the film version of “The Wizard of Oz,” he described his father as being “prone to explosions, thunderous rages, bolts of emotional lightning, puffs of dragon-smoke.” In short, he was the great, magical, horrible Oz. In time, he noted, he understood that his father had been a good man but a bad wizard. Judy Garland Art Video Wins Major Art Scholarship The two-channel After the Rainbow video piece by sisters Dan and Dominique Angeloro – who collaboratively work under the name of Soda_Jerk – was named the winner of the $60,000 scholarship earlier this month. Beating out 11 other finalists for the honour, the judging panel was unanimous in its praise for the video work – first exhibited in 2009 – which re-imagines classic film Wizard of Oz, with a twister instead transporting a young, hopeful Judy Garland into the future where she encounters her disillusioned adult self.